We are so happy you have stopped by to see what our program has to offer you! Please follow us on instagram under @highfalutinfurrybabies and like our Facebook page for updates! Here at Highfalutin Furry Babies we strive to set ourselves apart from other breeders by making sure that we only use the very best breeding lines for our program to ensure that we raise the healthiest and highest quality Bernedoodles available. We believe that providing a caring and loving environment for the puppy to grow is the best way to ensure that your furry is properly socialized and grows into a happy healthy dog. The first months are critical, just like babies. To achieve this goal, we raise all of our litters in our own home and never in a kennel. While our children interact and play with the "Furry Babies", they also have exposure to cats, horses, chickens, and endless snuggles, we believe stimulation and socialization should start right away. We also biosensor, use puppy culture, and access using the Volhardt testing to ensure we are helping the process of matching. We absolutely believe that when it comes to raising your future furry baby that quality must take precedent over quantity and so we have a limited number of litters each year. We are a high quality boutique dog breeder, not a an assembly line or glorified puppy mill. We are proud and humbled that so many wonderful families believe in Lexie's vision and helping us give back constantly. 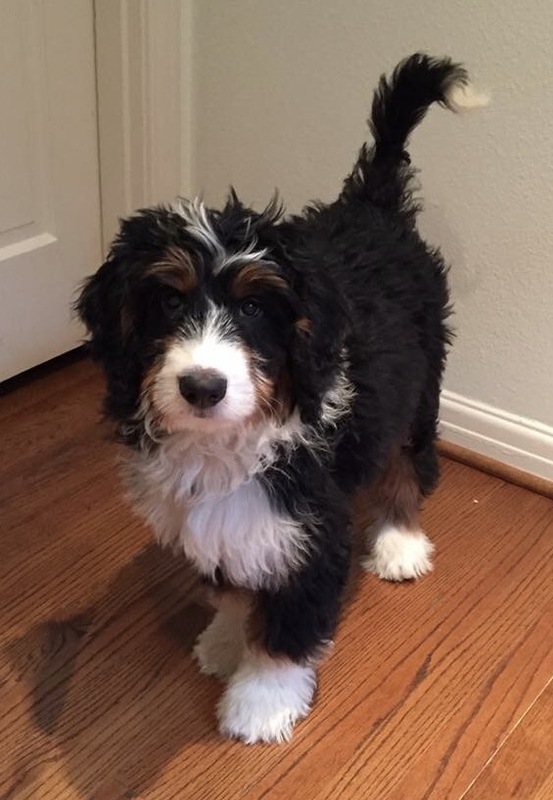 Unfortunately, due to the nature of our program and due to the overwhelming number of families who believe in what we do, we do not have any Bernedoodle puppies available for adoption immediately. Please be aware that currently there are no puppies available for adoption immediately at this moment as we currently have a waiting list for adoption. This wait could be as short as a few months depending on the type of Bernedoodle you wish to adopt. We have been told the wait is well worth it. Read some of our reviews on Facebook. If you understand this and are happy to proceed then please fill out an application form and we will look forward to welcoming you to our Highfalutin family. After much discussion between my husband and I, we (or actually I) finally resigned to the idea that our boys needed a big dog to play with. 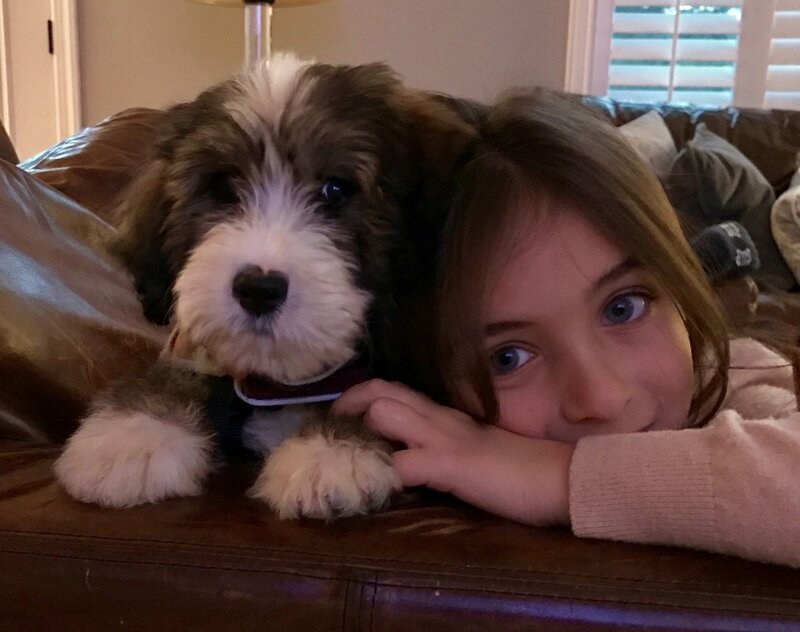 We did tons and tons of research on different breeds, and finally settled on a Bernedoodle. Then came the hardest part; finding a good, honest, and reputable breeder. After speaking to several breeders, we finally found Alicia! We were instantly impressed with her. She wanted to know just as much about us, as we wanted to know about her and her puppies. So important to find a breeder that cares about where his or her puppies are going. You could tell that this was not just a business for her, but a passion and a true commitment to the breed, and each individual puppy! She really made the entire process so easy, as she always kept us completely informed, updated us with professional style pictures each week, and was on hand for any and all questions. One of the many things I loved about using Alicia as a breeder, is how much she socialized the puppies, something that is so important in those first formative weeks. Many videos and pictures were sent to us, of not only her 3 children playing with our puppy Maggie, but her kids friends too! When my husband first went to see Maggie, he was so pleased to see that all the puppies were in her house, being hand raised right outside of Alicia’s bedroom. She treats these furry babies as if they were her children, and it shows! When we got Maggie, we were presented with a care package of toys, a blanket that smelled like her mother, and an amazing binder filled with not only Maggie’s health documents, but a ton of other great info as well. The instant we got Maggie home, we all fell in love with her. Not only is she ADORABLE, but she is the sweetest, mellowest girl! She plays so well with my 2 young boys, and is incredibly smart. Learned to sit after just 4 times. We love to take her with us to my sons baseball practices, because she loves everyone, and everyone loves her!! Could NOT be happier!! We have some fabulous planned out litters. Please contact me for more information by filling out the application, to see if we are a good fit for your family. We will be having Standard Size, F1B's, Mini & Micro sized & Teddy Bear Bernedoodles in the coming months!